The other day, EB needed to rename about 400 files in folder. She asked me if I knew of any good file renamers. File renamers are not my area of expertise since I seldom need one. I don’t take many digital photos since my digital camera has seen better days. I’m saving up for a nice digital SLR -which I hope to purchase sometime before I kick the bucket. So I put in on my bucket list along with eating a gallon of homemade strawberry ice cream in one sitting and visiting Edgar Allan Poe’s grave. See what a simple guy I am? Anyway, I disappointed EB because I had no fantastic file renaming utilities that she liked – and I sent her a couple. She wanted speed, man! Real speed. She’s always in a hurry and every file renaming tool I recommended wasn’t fast enough for EB – or didn’t do what she needed to it to do. Actually, she wanted to name hundreds of GIF files in several folders. No. I don’t know why, let’s not even get into that. 1. She hates help files – so it had to be super easy to use. 4. It had to provide a preview of the renamed files before proceeding with the actual renaming. Nothing worse than pushing a button and renaming 400 files with some ridiculous name that isn’t what you want. Then one day it happened, Jackie Paper came no more, and Puff that mighty dragon, he ceased his fearless roar. No, sorry, that was Peter, Paul and Mary. Then one day it happened, I got an email from EB and she was ecstatic. At her age, almost anything makes her giddy. She found the renamer of all renamers – the paragon of file renaming tools – she found Métamorphose. She renamed all her GIFS and told me it was the fastest, easiest to use, file renamer in the world. She likes to exaggerate too. But don’t let that fool you. If she’s happy, I’m happy and if I’m happy you’ll be happy. I tried it and it was the fastest, bestest file renamer in the world and for once, EB was right! See if you look below you’ll see I really did try it. Usually, when she recommends something, I just say, “yepper, that’s great” and she’s happy – even though I never bothered to look at whatever she wanted me to look at. But this time, I really did try it, honest! Note how I renamed the files on the left with new names (see the files on the right). Took me about 1.2 seconds to do that. There were 76 files in that folder. I didn’t read the help files. I just installed it, started it up, found a folder full of images, chose a prefix to append to the files and clicked “Go!”. I love the exclamation point after Go! it’s so cheerful. If you have tons of digital images with names like DSC-4481228 or you collect illegal MP3s (just kidding) you might find a utility like this useful. If you just got a digital camera, you’re going to find a tool like this useful. If you archive a lot of backup files, you will find a tool like this can help you organize those files with arcane names – give them names you can remember. You can rename by appending dates or times or anything you like. By now you get the idea or you don’t. If you don’t you don’t need this program. I’d be remiss here if I didn’t allow the developer to have his say. He’ll be a lot sharper and clearer than I have been and you’ll be happy I’ve invited him into this little box to enlighten you. OK, Mr. Developer – take it away! 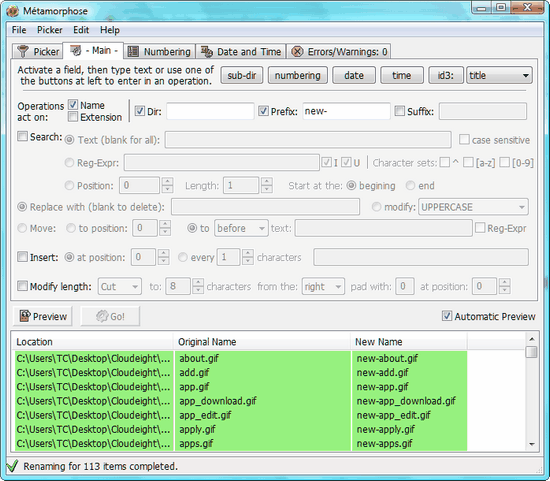 “Métamorphose is a free, open source program to mass rename files and folders which combines great flexibility with an intuitive interface. A professional renaming tool for almost any situation, it has many powerful functions. Well suited for those that need to rename many files and/or folders on a regular basis. In addition to general usage operations, it is useful for photo and music collections, webmasters, programmers, legal and clerical, et cetera. Preview every item to be renamed before committing changes. Load all files in directory and in subdirectories (recursive renaming). Undo renaming operation in case of mistakes. Rename MP3 files according to their ID3 tags. Rename image files according to their EXIF tags. So there you have it, EB’s freeware pick for today. If you need to rename a lot of files quickly (and easily) then you’re going to love Métamorphose. You can read more about it and/or download it from the product’s home page.